I applied to L V Prasad Eye Institute, India, having heard about the institute from Prof Bruce Spivey and Prof Marilyn Miller who had come to Nigeria. It was not an easy decision; but I had seen some of our Nigerian patients returning with excellent vision after cataract surgery, and I wanted to master the art and be a handy resource at home, so I soon settled down to life in India along with my family. It was a wonderful experience in all aspects at LVPEI. As part of the program, I was taught to have a high sense of responsibility in handling patients and to discharge my duties with utmost care and precision. There is no room for error in the care of patients and every effort is strenuously directed to avoiding this. The one thing that stood out was the diligence and hardworking nature of the Indian people. No wonder, people come from far and near to access the quality health care. At the same time, the staff members are able to write papers and publish them in peer reviewed international journals. I have been privileged to work with some of the world's best ophthalmic staff and listen to lectures on a daily basis to world experts who visit from time to time. Indeed I am glad I came to LVPEI. It has changed my perspective and has tremendously impacted my professional life. Soniya Kishanlal is a young woman from Punjab. On her first visit to LVPEI in May 2014, she underwent eyelid surgery performed by Dr Tarjani Dave and her team to separate her eyelids that had fused after acid was thrown on her face by an irate neighbor over an argument in August 2013. She underwent a second surgery in June 2014 by Dr Sayan Basu and his team for an Auro Kpro, a corneal prosthesis used to replace a small, round portion of the patient's damaged cornea. 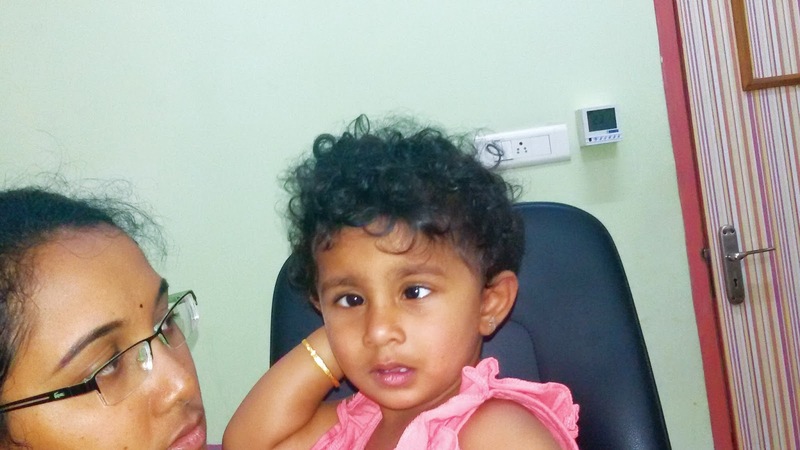 Lingineni Renu Sai Sreya was a 15 month old baby with squint since birth. The family being residents of London took the baby to a famed medical centre there but not much could be gained as the child was uncooperative and they were repeatedly asked to come back for another visit. The family communicated with Dr Niranjan Pehere at the Kode Venkatadri Chowdary Campus in Vijayawada through email, to discuss their fears about the child developing lazy eye, and then decided to come over to the centre during their visit for a family wedding. Though the baby was uncooperative at first visit, the experience team at the David Brown Children's Eye Care Centre managed to get reasonably reliable measurements of squint and even posted the child for surgery. The outcome of the surgery at first post-op were excellent and the family were able to happily go back to participate in their family wedding. The baby's mother in particular was amazed that the problem which was dragging on back home in London was resolved so quickly during a visit to their hometown in India!